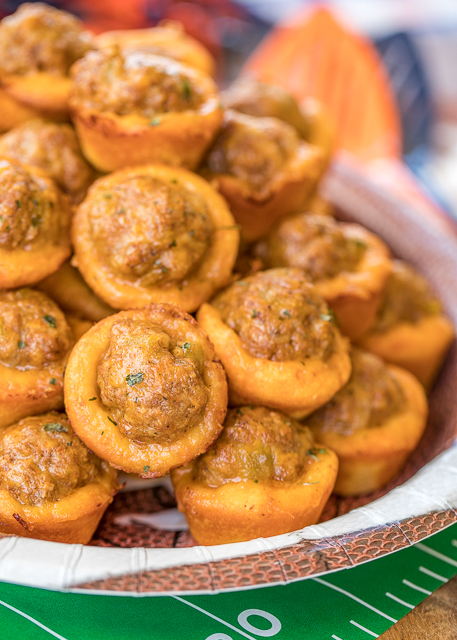 Taco Biscuit Bites Recipe - taco seasoned sausage, green chiles and cheese baked in mini biscuit cups! SERIOUSLY delicious! Great for parties and tailgates!!! Can make ahead for easy entertaining. Only 5 ingredients and ready to eat in 15 minutes! Dip in salsa and/or ranch. These things FLY off the plate! Football season is in full swing!! As much as I love watching the games, I really, really LOVE tailgating! We've been tailgating every weekend, and it starts to get a little expensive. 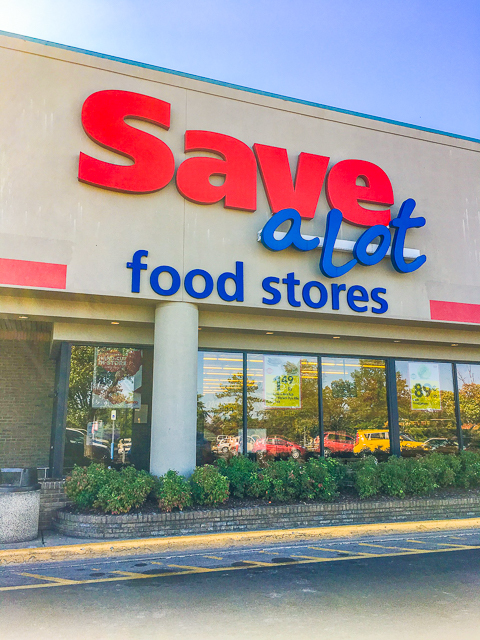 To save some money, we did our most recent tailgate shopping trip at Save-A-Lot. 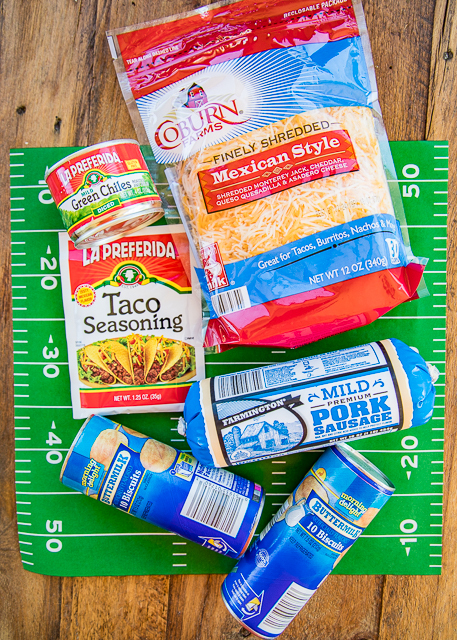 Save-A-Lot has all of the essentials to throw an epic tailgating party at great every day low prices! 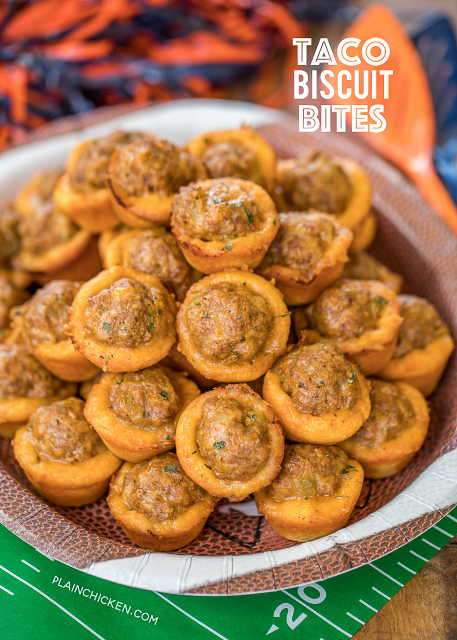 For this weekends tailgate, I decided to make these yummy Taco Biscuit Bites. I got everything at Save-A-Lot for only about $8 (prices may vary by location). I even had a cup of cheese leftover to use in another recipe! So these Taco Biscuit Bites were really about $7 total. You seriously can not beat these prices! PLUS they had everything we needed for our recipe in stock. We even picked up some plates and plastic utensils for the party. SCORE!!! These Taco Biscuit Bites scored BIG on taste in our house. We made a test batch this week and ate them for lunch. OMG! Seriously delicious!! Sausage seasoned with taco seasoning, green chiles, cheese and baked in biscuits. I mean, how can that be bad?!?! 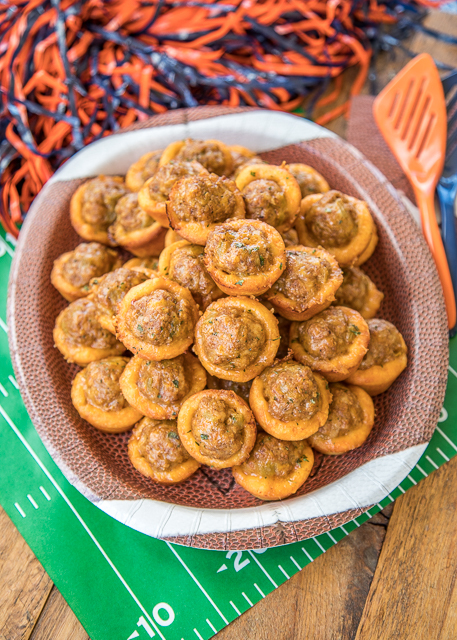 Not only are these Taco Biscuit Bites delicious, they are super easy to make. They are ready to eat in under 15 minutes! We just ate the Taco Biscuit Bites plain, but they would also be great dipped in some salsa, ranch or a combo of salsa & ranch. YUM! If you like to make recipes ahead of time, you can mix up the sausage mixture and finish assembling them when you are ready to bake. You could even make them all the way and freeze them and just reheat them for later. Either way is great. One note on this recipe, you do NOT pre-cook the sausage. 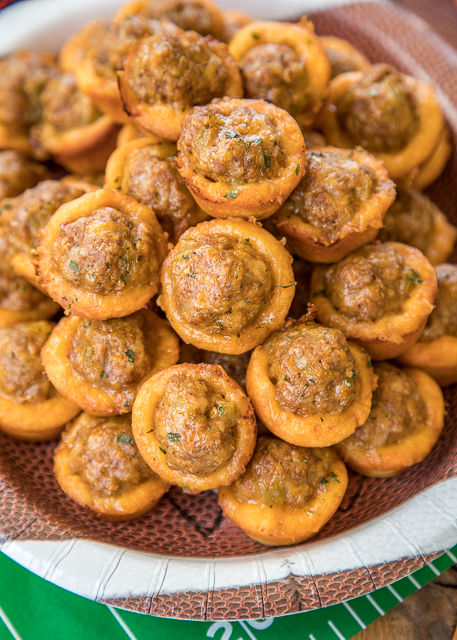 You bake the sausage raw inside the mini biscuit cups. I PROMISE that it gets fully cooked. You are sure to find everything you need for a lot less! Now, that is what I call a TOUCHDOWN!!! !